Summary: Five toys sit on a window sill and look out: a spotted owl, a dog on a sled, a pig with an umbrella, a bear with a kite, and rabbit wearing a star-circled collar. They are waiting for the moon, the rain, the wind, and snow and for nothing in particular-just waiting. A visitor, a storm, a rainbow, icicles, clouds, and changing seasons engage them as they wait before the window. One day they are joined by a cat with patches that proves to be a nesting doll opening into five cats. She (he?) joins the other animals waiting in happy anticipation of what each day will bring. Literary elements at work in the story: It’s almost unfair to tell this non-story for it makes the book seem less than it is. Kevin Henkes, a winner of numerous awards, speaks a child’s language and the lives of their toys are real to them. In soft pastels and brown pencil outline and with sparse text, five appealing animals make waiting a happy, peaceful experience, giving value to the now as well as the future. There are some mysterious elements in Waiting- surprises, uncertainties, and gifts- but the total effect is to invite the reader into a quiet, satisfying time of welcoming what will come. How does the perspective on gender/race/culture/economics/ability make a difference to the story? These do not apply though it should be noted that the assurance of expected good that runs through this story is possibly a product of security and positive experiences. Would a refugee child from Syria or a violent inner city neighborhood have such expectations? Theological Conversation Partners: Depending on the translation, the words wait or waiting appear at least 140 times in the Bible. It’s a major theme: waiting on God, waiting for God, waiting for God’s Kingdom, waiting for the Bridegroom. But waiting has a variety of meanings and varying levels of intensity. 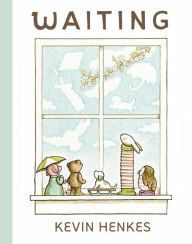 This Waiting is a story about toys as a child might see it. Children wait-for parents (“Just a minute” is frequently a misleading term. ); they wait for events like birthdays and Christmas. Because their lives are unfolding with most of it future, they are, in a sense, waiting every day. There are some clues here about how to wait: focus on the world around you, enjoy its beauty, share the waiting in community, welcome surprises and new friends. Waiting and living well are almost the same. This book offers a good opportunity to talk with children about an aspect of their lives that may be frustrating and difficult. And adults can learn along with them about how waiting may be a blessing and opportunity. However, waiting in the biblical sense is filled with anguish, with a history of suffering, with hopes for justice, with confidence or lack of confidence in God, with alert preparation and readiness to serve. (See, for example: Ps. 13, Ps 27:14, Ps. 43:5, Matt.24:42-44, Mark 13:32-37, Acts 1:4) These dimensions of waiting are outside the scope of the audience for this book. If Waiting brings Advent to mind, remember that the primary focus of Advent is the return of Christ and that the passive waiting of the animals lacks the urgency of waiting for Christ. However, Waiting does depict the passage of seasons. If 4 weeks seems a long time until Christmas, and a year seems a long time for toys, how long would 500 years seem? It also depicts the importance of community. Waiting with other Christians is better. How did the toys get on the windowsill? Some of them are waiting for specific things. What? Are any of them waiting for a person? The toys are satisfied and happy while waiting. Why? What are some things that they see out of the window? How long do you think they will wait? Name some things for which you have waited? Name some people for whom you wait? Do you ever complain about waiting or wish the time would go faster? Do adults have to wait? Is it easier to wait when you know how long it will be? What are some ways that we wait during Advent? Waiting by Storypath is licensed under a Creative Commons Attribution-NonCommercial 4.0 International License.